At one time, there lived a beautiful princess named Kadita. Because of her beauty, she was called Dewi Srengenge which means the beautiful sun. Srengenge is the doughter of King Munding Wangi. Although the king had a beautiful daughter, he was always sad because he really was always hoping to have boys. The king was then married to Dewi Mutiara, and gets a son from the marriage. And he is so happy. Dewi Mutiara wants for his son later became king, and she was trying to get her wish was materialized. Then the Dewi Mutiara came to the king, and requested that the king sent her daughter away from the palace. Of course the king refused. "It's ridiculous. I am not going to let anyone who wants to act rude to my daughter", said King Munding Wangi. Hearing the answer, the Dewi Mutiara smiled and said sweetly until the king was not angry anymore. But even so, she still intends to fulfill her desire that. In the morning, before sunrise, Dewi Mutiara sent aides to summon a shaman. She wants the shaman curse Kadita, her stepdaughter. "I want a her beautiful body full with scabies and itching. If you succeed, then I will give a reward that you never imagined before." The shaman obeys the queen. In the evening, the Kadita body was met with scabies and itching. When she awoke, she realized her body and filled with foul-smelling ulcers. The beautiful princess cried and did not know what to do. When the King heard the news, he became very sad and invited many physicians to cure her daughter. He realized that his daughter's illness was not fair; someone must have been cursing or using santet. The problem becomes more complicated when the Queen Dewi Mutiara forced him to drive his daughter. "Your Daughter will bring misfortune for the whole country," said Dewi Mutiara. Because King did not want her daughter to be rumors all over the country, eventually he was forced to accept the proposal of the Queen Pearl to send her daughter out of the country. The poor princess went alone, without knowing where to go. She was almost unable to cry anymore. She does have a noble heart. She does not hold a grudge to her stepmother, instead she always asked for God with him in a bear suffering. Almost seven days and seven nights she walked until she reached the Southern Ocean. She looked at the ocean. The water is clean and clear, unlike other ocean water is blue or green. He jumped into the water and swim. Suddenly, when the Southern Ocean water touched her skin, miracles happen. Sores disappeared and there was no sign that she had scabies or itching. Instead, she became more beautiful than ever. Not only that, but now she has the power to govern the whole Southern Ocean. 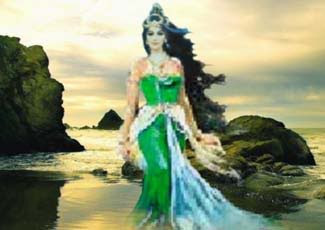 Now she became a fairy called Nyi Roro Kidul or Queen of the South Ocean that live forever.